Home>Music> T.I. Shuts Down Bankruptcy Reports: "Y'all Running Bogus Stories Now?" In an era where publications race to be the first to break a story, sometimes things can go awry and, because of the invention of the internet, news comes at a much faster pace than ever before. Because of the rate that stories are coming in at, a "fake news" phenomenon has broken out where even the President of the United States has taken a stance against the media. Earlier today it was reported that T.I. had filed for bankruptcy over a failed transition into the restaurant business. T.I. caught wind of the reports making their way around and decided to call out Page Six, who had reported the story, for creating false rumors. In reality, T.I. 's money moves are just fine, in case you were wondering, as the Atlanta rapper shut down the rumor on Instagram. Reposting the publication's headline, T.I. confirmed that the news was false, writing, "@pagesix y’all running bogus stories now?" 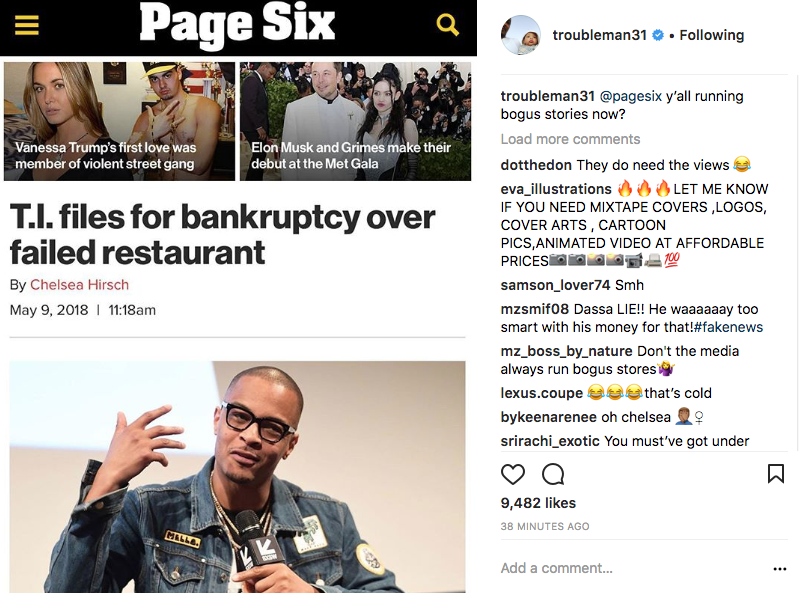 Page Six has since edited their article to clarify that the rapper's restaurant partner Charles Hughes had filed for bankruptcy and not T.I. himself. Although his venture into the restaurant industry was not entirely successful, it was not bad enough to bring down T.I. 's fortune as he claims to still be financially comfortable. After his cameo as "the People" on Kanye West's new song "Ye Vs The People," T.I. is currently working on his upcoming TV show The Grand Hustle and addressing social issues via his social platforms. MUSIC T.I. Shuts Down Bankruptcy Reports: "Y'all Running Bogus Stories Now?"